"Life is a perpetual instruction in cause and effect." Cost avoidance (economies of scale). 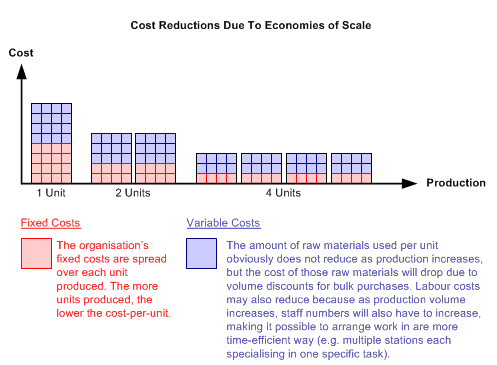 Cost reductions from improving efficiency (and therefore output). 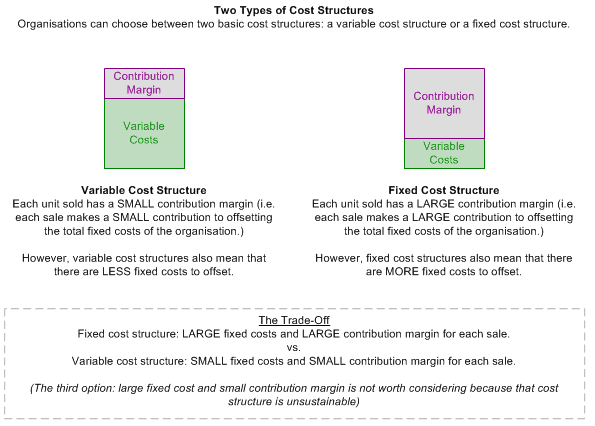 Cost structure. Changing the mix of fixed and variable costs. Cost assignment. Tracing, rather than allocating, costs. Economies of scope. Sharing of costs across multiple product/service offerings. Business cases for IT-enabled projects are often built around cost savings. However, projects can affect an organisation's costs in another four ways. Understanding these five effects is important because all of them should be considered when preparing business cases, although not all are applicable to all projects. Let's start with the most obvious cost effect, cost savings, which are illustrated below. Most business cases include some level of cost savings but including these is a double edged sword: cost savings are easy to include, but hard to realise. Failure to take costs out. Costs are reduced only if they're taken out of the system (the business unit, the process, the product). If a department had an annual budget of $5 million and a business case proposed cost reductions of $500k, that department should only need a budget of $4.5 million next year. It's that simple, but it rarely happens. In most organizations, that department will still get the $5 million, arguing that the project did indeed deliver the $500k in savings, but those savings have been 'reinvested' (e.g. the people that were doing work that became redundant were redeployed to different work). Freeing people up to do different (hopefully productive) work is certainly a benefit, but it is not a cost saving (you're still paying the redeployed people and your costs haven't changed). Poor cost visibility. Eliminating costs which span organisational boundaries, budget centres and reporting lines is possible but for two reasons it rarely happens. Firstly, while many people may be responsible for reducing costs, no one person is accountable for ensuring it happens. Secondly, most organisations don't have sufficiently advanced management information systems to be able to track costs that span budget silos (e.g. organisations can't tell you how much the order-to-fulfilment process costs per order). For these reasons, the cost savings listed in business cases should probably be reclassified as cost avoidance, rather than cost savings. 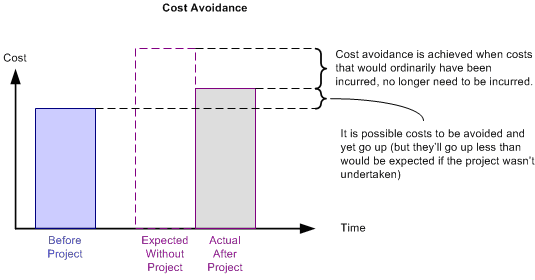 The key difference between cost savings and cost avoidance is that the latter doesn't actually reduce costs. As the diagram below shows, it is possible for total costs to actually go UP even as costs are avoided. delay paying cash for as long as possible. Cost avoidance essentially delays expenses, leaving cash in the company for longer, and thus improves cash flow. Implementing an Interactive Voice Response (IVR) system which prompts callers to select their reason for calling and enter their customer number. Cost reduction: Since each call now takes less time, it may be possible to reduce the number of staff in the contact centre. Cost avoidance: Instead of reducing staff numbers, the company may decide that the time saved is enough to conduct a cross-selling/up-selling campaign without increasing staff numbers in the call centre. Reduction in variable costs.Variable cost can be reduced through volume discounts on raw materials and increased specialisation of labour. Spreading fixed costs across more units. By spreading the cost of the factory across 100,000 widgets instead of 10,000, you'll drop the cost-per-widget ten-fold. By increasing efficiency, it means that production can increase without an commensurate increase in costs. Fixed costs: fixed costs do not change in response to changes in output. For example, the cost of a factory WILL NOT change whether you produce 10 widgets or a million widgets. 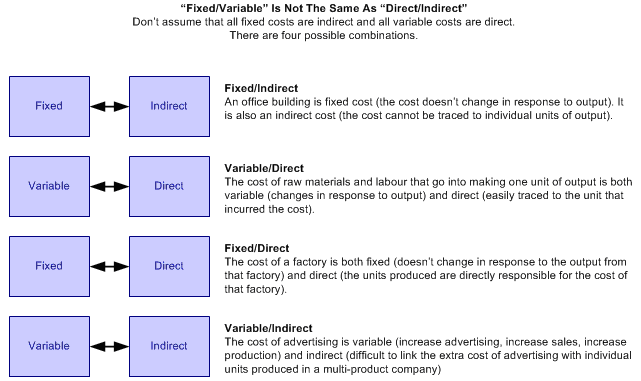 Variable costs: variable costs change in response to output. For example, the cost of raw materials WILL increase if you increase production from 10 widgets to a million. 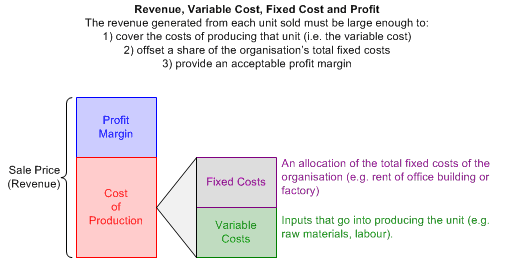 The mix of fixed and variable costs, is known as the organisation's cost structure. The ideal structure depends on the unique circumstances of each individual organization – there is no one 'best' cost structure. 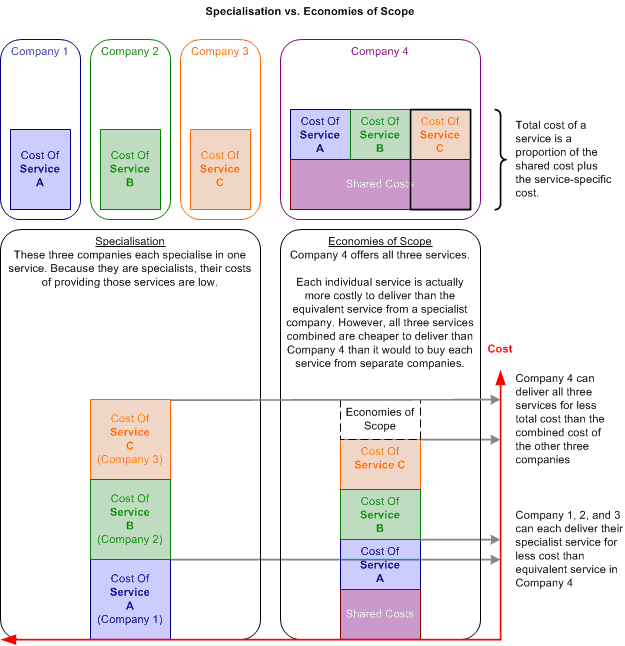 As the following diagram illustrates, there are no profits until all of the organization's fixed costs are covered. In summary then, management considers the following trade-offs, makes a prediction about sales volume and then organizes the cost structure accordingly. Understanding how a proposed project will affect the organization's cost structure is critical because it must be in full alignment with management's strategic direction. It's important to point out that cost cutting and efficiency initiatives are a separate issue to choosing the cost structure. Regardless of which cost structure is chosen, cost reductions must happen in both types of costs (i.e. 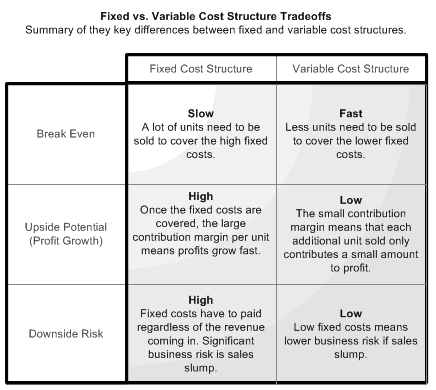 just because you choose a fixed cost structure doesn't mean you only eliminate variable costs, and vice versa). 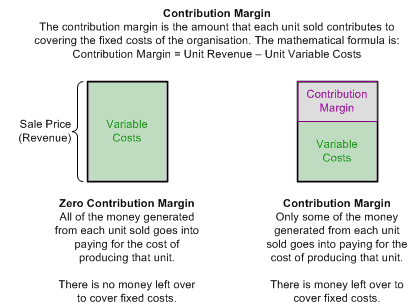 Given the turbulent economic times (November 2011 as I write this) it's not surprising that many organizations are moving towards a variable cost structure. 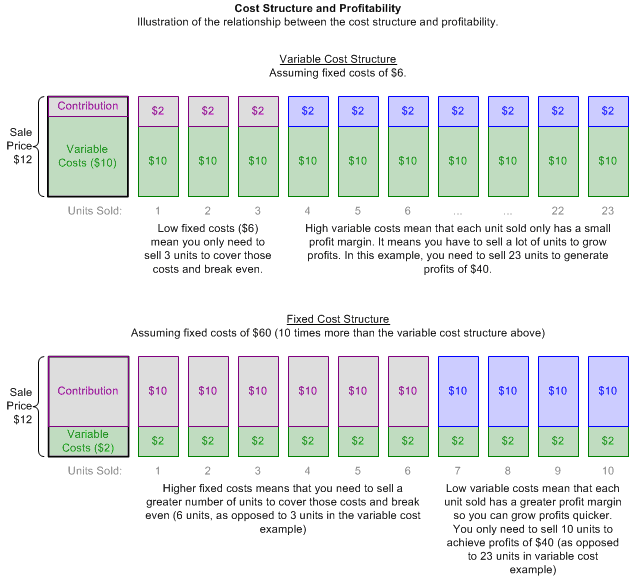 As illustrated earlier, a variable cost structure protects you from downside risk (lower fixed costs mean you need less sales to cover them). It is easy to scale costs up or down in response to fluctuating demand for products and services. Outsourcing projects are often seen as a mechanism for cutting costs but they are also ways of converting fixed costs to variable. If, for example, you want to scale your call centre up or down it is a lot easier to increase or reduce capacity if the call centre is run by a third party than if you had to do it internally. Some outsourcing services charge 'per transaction' and this is the ultimate in variable cost (e.g. per invoice sent, per phone call handled). While cautious organizations convert their fixed costs to variable in order to protect themselves from downside risk, other organizations look to capitalise on upside potential (even making capital investments and expanding during recessions to get a jump on the competition when the economy starts to recover). The "fixed vs. variable" decision is really about the expected volumes of output and management's tolerance of risk. The higher the expected volume, the greater the justification for fixed costs – but the greater the risk if volumes don't meet expectations. Projects that reduce transaction costs convert variable costs to fixed. For example, you could increase the size of the contact centre to handle increased call volumes as the customer base grows (the variable cost approach). Alternatively, you could provide online facilities to allow customer self-service. However, you would have to move enough customer interactions from the high-cost contact centre channel to the low-cost web channel to justify the fixed cost of the application and the infrastructure it runs on. Knowing what your costs are is not the same as knowing where they are. Costs can only be managed if you know what is causing those costs. The following diagram illustrates two types of cost (direct and indirect) and how each is assigned to output . In an ideal world, all costs would be directly traceable to the products/services, processes and business units that incur those costs. Unfortunately, perfect traceability is either impossible or not economically feasible (the cost of such traceability would outweigh the benefits). 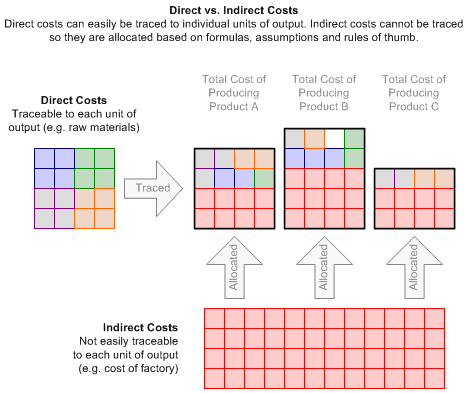 Cost traceability projects do not reduce total costs (they merely reclassify them from indirect to direct) but there is still business value in pursuing such projects. Inaccurate allocation. They feel that method of allocating IT costs is inaccurate (or even arbitrary) – based on headcount or revenue or some other metric they feel doesn't accurately reflect their consumption of IT resources. Lack of control. Even if the cost was accurately traced (as opposed to arbitrarily allocated) to their business unit, managers would still be unhappy because they have no control over those costs. They'll agree that the cost of PC charged to their business unit is their cost, but they'll dispute why IT mandates the use of a $2000 PC when they can get a $500 PC from Dell. Traceability. When costs are accurately traced, rather than arbitrarily allocated, managers can begin to manage those costs by implementing changes and seeing the results in the cost figures. Control. As in the IT example, managers will not have direct control over some costs which are traced to their area of responsibility. However, better traceability opens the lines of communication. Debates (e.g. outsource vs. insource, centralize vs. decentralize, $2000 PC vs. $500 PC) are far more constructive when discussions are based on facts). Since an organisation's customer contact centre services all customers and all products, poor IT systems could mean that the contact centre's cost may have to be allocated to various product lines based on some arbitrary calculation such as relative sales volume (Product A accounts for half the sales volume so it's assumed it gets half the support calls and therefore should be responsible for half the cost of the contact centre). Such cost allocation may not reflect reality. This situation would be improved with the deployment of a new call centre management system. If the system lets you time calls accurately and record which products the call was about it would then be possible to accurately trace contact centre costs to the products that incur those costs. Incidentally, tracing costs to customers, not just products, is also a good idea as it will allow managers to work out the lifetime value of customers (highest revenue customers may not be the most profitable if they are costly to service). Deploying collaboration and knowledge management tools allows people in different areas of the business to join forces and offer a unique product. Management consulting companies are experts at generating economies of scope. They package up their internal knowledge and expertise into numerous service offerings. When clients engage these consulting companies they aren't just paying for the consultants that walk through the door – they are paying for the collective knowledge of the entire consultancy. There is also a third type of cost: semi-variable. These are hybrid costs that have both a fixed component (which doesn't change with output) and a variable component (which does change). An example of this would be a phone bill where you pay a fixed monthly access charge and then variable call costs on top of that (the more calls you make, the more you pay). The process by which management analyses cost structure relative to expected volume is called Cost-Volume-Profit Analysis.